The Brightech Gabriel LED Reading and Floor lamp is the perfect match for all your indoor lighting needs. Light up your arts & crafts, reading, sewing, wood working, and any other hobby to the level you like with complete ease. It's great for living rooms, workshops, and even garages. The Gabriel gives you bright white light that does not produce heat and stays cool to the touch, so that you can work on your project for hours without the worry that comes with incandescent and halogen lighting. The lamp powers on and adjusts brightness levels via a convenient dimmer foot switch extending from the lamp pole. A single touch brightens your space with 100% brightness while a second touch dims the light down to 50%, a third touch brings the lights down low to 30% to help you set an atmosphere suitable for any occasion or task. The Gabriel was designed to make adjusting light and where it is focused easy. The domed head has an omni-directional pivot point so that you can rotate the head for any activity or task. Easy to install lighting such as the Gabriel are the perfect alternative for complicated light fixtures. No holes to drill, no sheetrock to cut, and no hassle to setting ideal lighting for any occasion! No additional tools are necessary for the job either, just follow the easy to read manual included in the packaging, plug it in and voila. Let the light shine on! Head Height: 45"-64"; Reach of head is approximately 39"
BEAUTIFUL BRIGHT WARM LIGHT FOR HOME & OFFICE: Perfect for both mood and task lighting, Brightech's Gabriel LED Floor Lamp solves your home or office needs. With its built in LED bulb, this modern standing lamp helps illuminate small details and is perfect for the hobbyist. It features a tall slim body that fits easily in tight nooks and crannies and an LED bulb with 2700k color temperature and 575 Lumens for a soft but bright look. This lamp will make you feel warm and cozy in any room. ADJUSTABLE WITH 360° OF AVAILABLE LIGHT: This lamp has an omnidirectional LED light fixture that can pivot or rotate 360° to shine light to all corners of your living room, bedroom, or office. The angle of the head can also be adjusted to accommodate for times when you need the light more focused on the task at hand. The built-in dimmer foot pedal lets you adjust between the three brightness levels and set the perfect lighting for your mood or tasks. 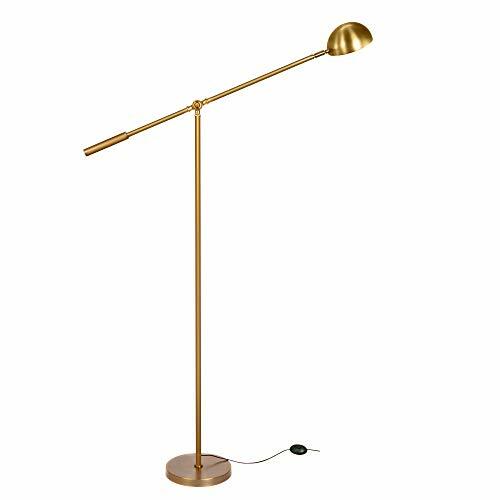 GREAT LAMP FOR READING OR HOBBIES: With its sleek finish and elegant minimalistic lines, the Gabriel LED Floor Lamp combines fashion and function. It's great for contemporary, traditional, urban, minimalistic, rustic, modern mid-century and industrial décor schemes and is bright enough to illuminate your hobbies. It is perfect for reading, knitting, writing, puzzles, and arts & crafts. Its adjustability features also allow you to position the light exactly where you need it. STURDY AND SAFE, USEFUL FOR KIDS ROOMS: The Gabriel's weighted, high-stability base ensures that no one, including kids or pets will knock it over easily. The LED remains cool to the touch even after hours of use which reduces accidental brush-burns and makes sure your spaces don't overheat.